I feel like I’m only coming to this blog and writing on (in?) it when I’m trying something new. I’m rarely coming back and updating, discussing, thinking things over… and rarely do I come and admit that I’m failing at whatever I’m trying. I think about it, but it’s really hard. Eating Like An Adult kind of worked- I stuck to it for a week- then something happened. I can’t remember what it was, but I derailed, and I didn’t get back on the bike. And so on to the next thing. This is the thing. Conserving mental energy so that you can stick with the eating plan for longer. I get excited about trying new ways of eating, I plan for them- and then I fall down. Staying strong and saying no all of the time is hard– especially so when I realise that if I am successful with whichever way of eating I’m trying, I will never have a donut again (for example). That I will be eating like this for the rest of my life. It may sound like I’m resistant to the change, but realistically I just find this stuff really, really really mentally hard. I find it hard to say no. I find it hard to think before I put something in my mouth. So I did some research, planned up my first low calorie day (with a goal of 600 calories), purchased and prepped the food, and I did it. I did it. I resisted other food, I said no to myself, I ate as I had intended, for an entire day. Crazy, isn’t it, that I’m proud of myself for one day of good eating. But knowing that I could wake up this morning and not say no just made the whole thing easier. I knew that I wouldn’t actually be waking up this morning and eating all of the rubbish food I could find, but it still made it easier to get through the entire day. I even said no to adding an extra teaspoon of soy sauce to my stirfry – it’s the small things, isn’t it? What I discovered was that you can eat an awful lot of vegetables for 600 calories. A lot. And for someone like me, for whom eating is about the physical act of having something to munch on at my desk, it was important that I have a lot of bulk in the food I allocated myself. I know some people do their 500/600 calorie days by eating no breakfast then splitting the calories across lunch and dinner, but I needed snacks and I needed coffee. 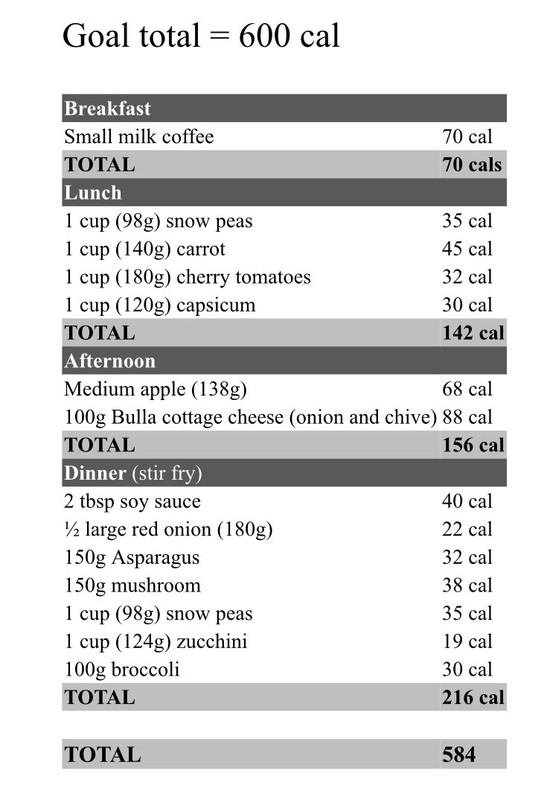 You can see my meal plan for the day below – I ended up not eating the apple, and adding a tsp of cornflour to my stirfry at dinner (mixed with water) to thicken the sauce. I used CalorieKing.com.au to do my initial calorie sums, but I also put them into a food diary app and got really similar results.